504 Pacific Drive is located in the prestigious gated community of Pineapple Hill within the Kapalua resort on the island of Maui. You will be captivated by the magnificent panoramic Pacific Ocean views and the breathtaking sunsets, which encompass the islands of Lana’i and Moloka’i. Tastefully appointed this beautiful two story home consists of approximately 3,000 interior square feet, with three bedrooms and three en suite bathrooms, it is truly a custom showpiece. As you enter, you will be greeted by the natural light filtering through the entry skylights and one can’t help but feel a sense of the peace and tranquility throughout this home. As you gaze up the stairway you will immediately notice the beautiful custom etched doors by Maui artist, Don Crossley that captures a replica of the stunning Pacific Ocean and island views from this very location. The beauty of the 24” X 24” Italian Pavio stone floors throughout the entry, main living area, kitchen and office provides a seamless transition within each room. This home is being offered fully furnished with the exception of original paintings, artwork and sculptures. The newly remodeled and spacious kitchen features custom wood cabinetry enhanced with granite and quartz counters offers a large center island work space with built in cook top. Equipped with brand new top of the line Bosch stainless appliances it is truly a chef’s dream kitchen. With spectacular views from four separate dining areas one can choose a formal seating, outdoor lanai seating or a cozy seat at one of two informal kitchen dining areas. Adjacent to the kitchen is a separate clean and stylish office or artist studio with built in cabinetry and quartz counters. The open floor plan seamlessly includes the kitchen, dining room and living room where unobstructed panoramic ocean views can be seen from every vantage point. Created with meticulous style and keen attention to detail is a comfortable executive style home for personal enjoyment and entertaining. All the bedrooms are separated throughout the home for optimal privacy. A complete Photo voltaic solar panel system was installed to ensure a low cost electric bill. 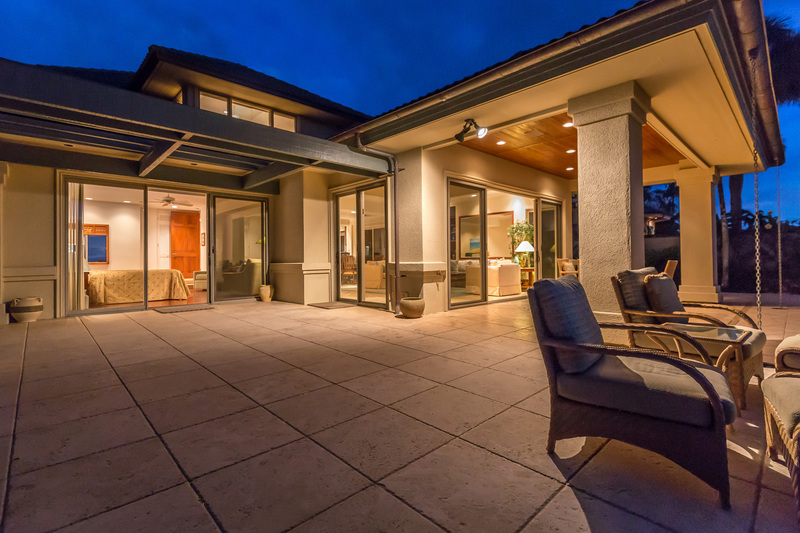 The exterior of the home offers a peaceful Hawaiian style environment with several large lanai areas for relaxing and entertaining while capturing the true essence of outdoor living this Maui home can offer.